(Huffington Post) Mitt Romney is tired of hearing about the change made to his book that touts Massachusetts' CommonWealth Care as a "model for the nation." But Rick Perry keeps bringing it up. So Romney proposed a $10,000 wager -- perhaps unprecedented in presidential debates, although we'll wait for Gingrich to provide the historical background. Sadly, Perry didn't want to take the bet, so we never got to learn what the terms were exactly. Instead, Romney quoted from the chapter in which he said that every state should have the opportunity to make its own health care plan. My colleague Ryan Grim quips: "How many people have you met who casually make $10,000 bets?" It's pretty "1 percent," if you ask me. To put the amount in perspective, according to a tweet from West Wing Report, "The $10K bet Romney offered to make represents three months pay for most Americans." 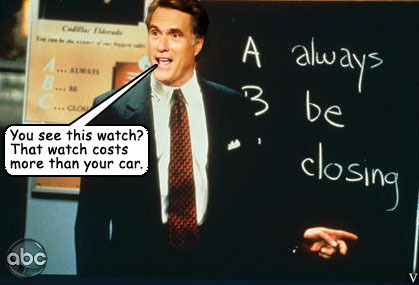 Conservatives didn't hold back on jokes directed at the wealthy Romney. Jonah Goldberg of the National Review tweeted that "Romney promises that his butler will 'personally deliver' $10,000 check if he loses," which was quickly retweeted by RedState's Erick Erickson. Jonathan Martin, who covers the GOP race for Politico, also pounced. "Who among us doesn't wager $10K at a time?" he tweeted. WASHINGTON (AP) — He could have bet a beer. Or maybe a steak dinner. But during a heated dispute with Rick Perry during Saturday night's debate in Des Moines, Iowa, Mitt Romney extended his right hand and asked the Texas governor if he'd wager $10,000 to settle a dispute over his healthcare record. The rich bet instantly provided Romney's opponents with new ammunition for their charge that he's out of touch with middle-class America. It was an exchange that spanned less than a minute. But it's one that likely won't soon be forgotten. Democrats and Romney's Republican challengers pounced almost immediately. "I want to know if he has $10,000 in his pocket," Newt Gingrich's spokesman, R.C. Hammond, said after the debate. 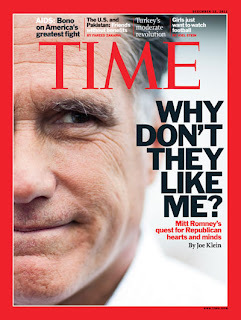 Romney's personal wealth and privileged background have long been viewed a potential political vulnerability. He's the son of a former governor and made a fortune leading a venture capital company in Massachusetts. Romney disclosed earlier in the year that his personal wealth is estimated at between $190 million and $250 million. But as a presidential candidate in recent months, he's made a point of courting middle-class America. "I didn't grow up poor. And if somebody is looking for someone who's grown up with that background, I'm not the person," Romney said during the debate, noting that his father was poor at one point in his life. "They made sure we had jobs when we were growing up. They made sure we didn't spend money foolishly." That did little to stop the Democratic National Committee from using the $10,000 bet to fuel an immediate political attack. In a statement, the DNC said $10,000 is almost three times more than what an average family spends on groceries in a year and more than a year's worth of mortgage payments for the typical American home purchased today.